Walk down the pyramid as the ancients did. The Mikerinos Pyramid is an iconic structure that cannot be admired enough. 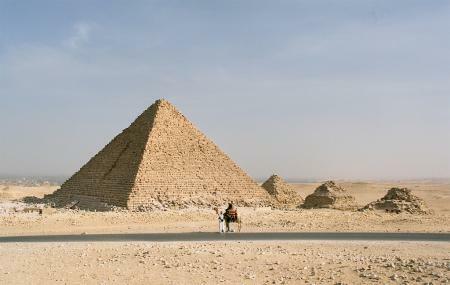 A visit here takes you back to the ancient era of the mysterious pyramids Egypt is famed for. In the area you can enjoy horse rides and buy souvenirs. A visit here will also get you familiar with the Egyptian culture. The Mikerinos Pyramid is the smallest of the three pyramids of Giza. How popular is Mikerinos Pyramid? People normally club together Kefre, The Second Pyramid and Pyramids Show while planning their visit to Mikerinos Pyramid. People also prefer to start their day with Mikerinos Pyramid.